EZVIZ brings the easy setup and operation of the Mini indoor camera to its high-res outdoor model. 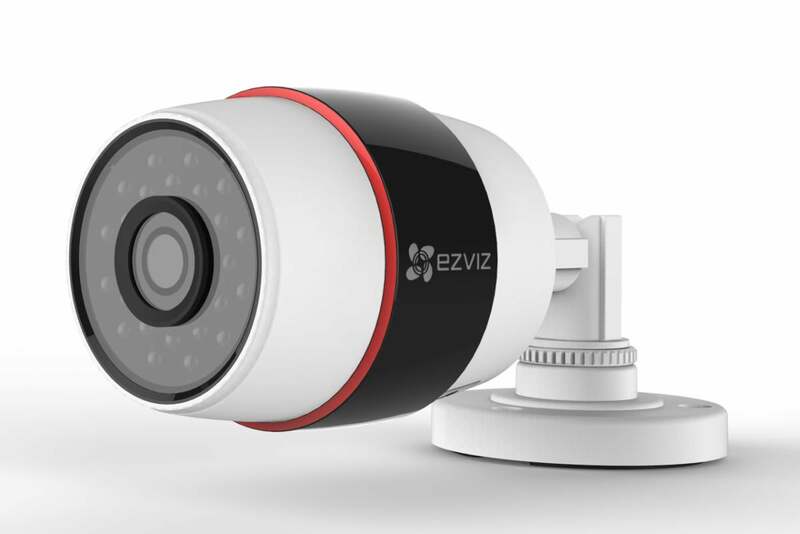 Ezviz recently released the second iteration of its indoor home security camera, the Ezviz Mini Plus. At the same time it issued its first outdoor model, the Ezviz Husky ($129). The Husky is a bullet-style camera, though a slightly more attractive one than you might expect. Most of these types of cameras take their design cues from the CCTV cameras found outside commercial buildings, a look that can give your home the feeling of a high-security compound. The Husky’s smooth surfaces and more compact design make it seem less severe and undoubtedly easier to blend in to the exterior of your house. The camera has an IP66 rating—it’s dust- and waterproof—and can withstand temperatures from -22 degrees F to 140 degrees F. It sits on a triple-axis mount, which can be securely affixed to the side of your house with a few supplied screws. A pair of cables sprout from the bottom of the mount. One connects to the unit’s power cord, the other connects to your network cable. Because the Husky supports PoE (power over ethernet), it can draw power from the same CAT5e (or higher) cable it transmits video on. This means you only have to thread one cable through the wall of your home if, like most homes, yours doesn’t have exterior electrical outlets. The rub is that you's also need a router or a switch that supports PoE. Most consumer models don’t, so you’ll likely have to purchase a PoE injector—they run $15 to $20—and connect it between the camera and your router or switch to use this feature. The Ezviz Husky is resistant to dust, water, and extreme weather. Like all Ezviz security cameras, the Husky delivers Full HD 1080p video with a nice wide-angle lens—in this case, 107.5 degrees. A ring of infrared LEDs provides up to 100 feet of night vision. You can monitor the camera’s live video feed on your mobile device via the Ezviz app, or enable motion detection to alert you via push notifications to any movement in the camera’s field of view. Don't miss any of our other home security camera reviews. You have several options for storing your surveillance footage. The Husky features a built-in microSD slot and comes with a 16GB microSD card to store video footage locally (it supports up to 128GB cards). Alternately, you can purchase the Ezviz Vault, a 1TB network-attached hard drive, separately for $190. You can also store your video in the cloud with an Ezviz CloudPlay subscription. For $6 per month or $60 per year, you get seven days of stored recordings; $11 per month or $110 a year gets you 30 days. You can also use all three methods simultaneously to ensure the security of your recordings in the event the camera is stolen or damaged or your network crashes. Before you mount your camera outside, you need to connect it to your network. You can do this over Wi-Fi or through a hardwired connection to your router. In either case, you just scan the camera’s QR code with the Ezviz app and follow a few onscreen prompts. 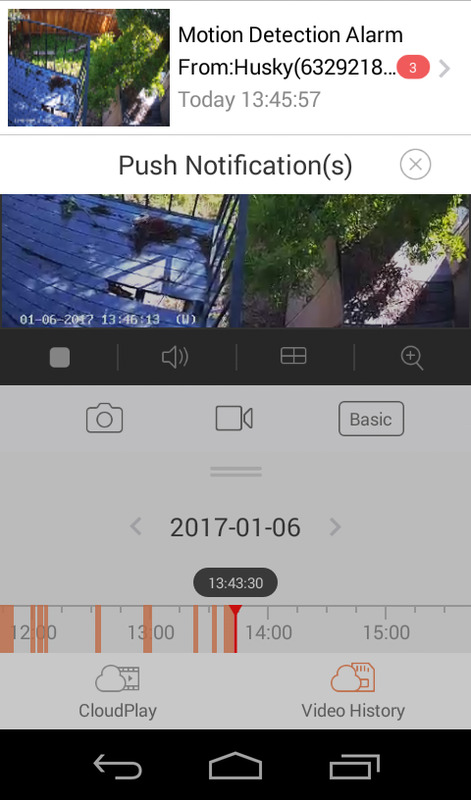 The Ezviz app features a video history timeline that makes it easy to find recorded events. The camera can be affixed to a wall or ceiling. A mounting template is included to help drill screw holes in the appropriate spots. If the camera is mounted within Wi-Fi range of your network and you have an outdoor electrical outlet, consider yourself blessed. At least one of these conditions won’t be met for most users, so chances are you’ll next need to connect an ethernet cable to the camera and run it into your home to one of the PoE-supported devices mentioned earlier. Once the camera is mounted, you can adjust the surveillance angle up to 180 degrees vertically and a full 360 degrees at its base. This can be a little tricky, though, as you have to loosen one screw and an adjustment knob, then set the angle and hold it with one hand while tightening that screw and knob with the other. 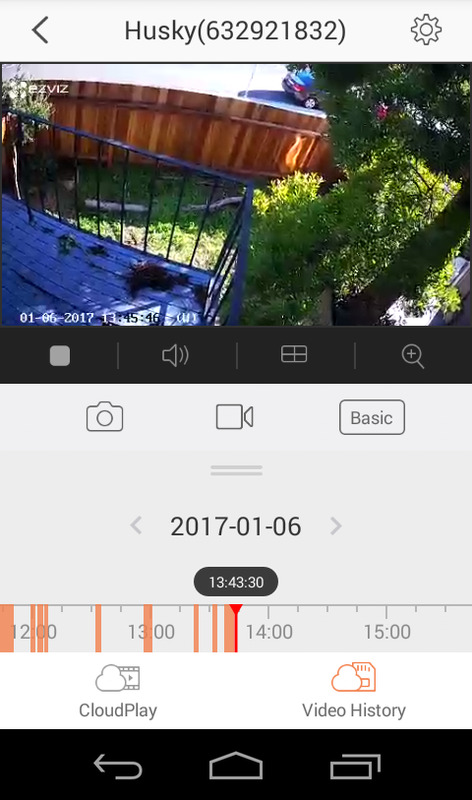 The recently revamped Ezviz app will display a screenshot from the Husky, along with those of any other active Ezviz cameras you have, on its home screen. Tapping it will take you to the Husky’s live feed, where you can view camera footage in real-time. From here you can also control basic functions such as muting the live audio; taking a screenshot or manually activating video recording; and toggling between basic, standard, and hi-def resolution. At the bottom of the Husky’s feed screen is a video history timeline where you access your locally and cloud-stored recordings. As you scroll through a particular day’s feed, recorded events are highlighted in orange so you don’t have to scrub through hours of footage to find the video-triggering events. At 1080p, the Husky’s video is as sparkling as you’d expect. If you find it eating up your bandwidth, though, you’ll find even the “basic” resolution perfectly adequate for surveillance purposes, even if the pixels are more noticeable. There is some slight image bending, but not nearly enough to grossly distort the image. The camera’s night vision had no problem illuminating my entire side yard and well into the street beyond. Motion detection sensitivity can be calibrated so you’re not bombarded with alerts. Motion detection can be tricky with outdoor cameras because there’s so much more movement outside our homes. In my tests, the Husky had to contend with everything from regular incursions of squirrels to a low-hanging power line that will swing in a light wind. Fortunately, you can calibrate the camera’s motion detection sensitivity in the Ezviz app on a scale from 0 to 6. The lower setting detects movement over wider areas, while the higher one offers more pinpoint detection. A little experimenting allowed me to find the sweet spot for my situation. The notification-scheduling feature also came in handy, as I could disable alerts during the commute hours when parades of people regularly hoof by outside my house on their way to and from a nearby BART station. The Husky performed well and is clearly a good choice if easy installation and hassle-free operation are priorities. The price tag is pretty attractive too—it's about $60 less than the comparable Nest Cam Outdoor. Just remember to factor the additional cost of a PoE injector into the final tally. A great outdoor camera for monitoring front porches, driveways, and small yards.